After months of anticipation and training, it was time for our Northern Circuit hiking trip! The Northern Circuit is a three-day hiking and hut trip through Tongariro National Park, which is in the center of the North Island. Its big star is Mt. Ngaurahoe, better known as Mt. Doom from the Lord of the Rings movies. You can’t climb Nguarahoe itself, but skirt all around its base and get some amazing views. As we are not particularly skilled outdoorsy types, nor did we bring any of our camping gear with us (which, let’s be honest, we don’t own any backcountry stuff) we chose to go with a guided tour group, Walking Legends. They deal with the food and arranging accomodations and we had to carry our own clothes, water, and sleeping bags for the trip. 10 miles on day one, 5 miles day two, and another 10 on day 3, staying in rustic huts along the way. Intrepid hiker unafraid of the looming clouds. Why he’s rocking a half style LL Cool J one pants leg rolled, I don’t know. I obsessively checked the weather before the trip, and nervously saw that it was slated to rain the entire time. As much as I was looking forward to the hike, I didn’t really want to have three soggy, cold, squelchy days in the backcountry. Touching a cloud. Pants mode: Full LL Cool J now. The day before the hike, the weather cleared at least for the first two days. It started off foggy but soon cleared to a stunning blue sky and long distance views. Nguarahoe remained shrouded in mist that day, however, and wasn’t revealed to us until the second day of our trip. Super windy here! Check out the boy’s pack strap fluttering in the wind. Pants: back down. It’s cold here! Distance view from the top with Blue lake just peeking out in the distance. Pondering by the sacred Blue Lake. To touch the waters is Tapu, as is to eat or drink by it. There are resident rangers at the huts along the way, who give a nightly chat about the surrounding area and safety information. They’re required to give information about what to do in case of a volcanic eruption, and in both instances the “safety talk” was basically a shrug and a recommendation to a) pull out your camera to record the event and then b) make sure you strike an intriguing pose so that when they dig your body out of the ash a la Pompeii, you will confuse the future archaeologists. Not exactly reassuring, but we escaped unscathed and eruption-free from the valley. The stars of Tongariro Park are the active volcanoes along the way, especially Mt. Ngaurahoe, best known as Mt. Doom from the Lord of the Rings movies. Fun fact about Mt. Doom – Peter Jackson approached the local Maori tribe about using the mountain in the movie, and they initially declined as the mountain is considered sacred, but eventually agreed as long as the top of the mountain was not shown on screen as that is the holiest part. Therefore all of the top of Mt. Doom that you see in the movies is CGI! None of the scenes with people were filmed on Nguarahoe either, only external shots, the people scenes were filmed on nearby Ruapehu, in what becomes the beginner ski area in winter. The volcanic valley between the mountains is Mordor, and it’s easy to see why – a dark rocky lava strewn landscape, with occasional bursts of steam emanating from geothermal vents makes for an eerie trek. The trek through Mordor. Fortunately, no orcs were spotted. The second hut was so beautiful! I taught the kids how to play blackjack, and we used scrabble tiles to bet. Great parenting. The last day of the hike, we awoke to a drizzly and windy morning. Our guide advised that 10 miles of hiking in winds and with wet river crossings and with children would prove to be a miserable day, and so we bailed out and took the three mile exit track to where a van picked us up. I’m disappointed we weren’t able to finish the last leg of the hike, but in hindsight it was the right move, as having six miserable hours of hiking in wet boots would have meant cranky and unhappy kids and where’s the fun in that? Happy, wet, tired hikers. They rocked it. Such a great trip overall, Walking Legends was incredible for making everything easy except the walking itself. Moreover, it was so peaceful to be unplugged and removed from the rest of the world, and something I think we should all have the ability to do more. As most people reading this blog know, last year we decided to extend our time out of the US for another year and I took a job in New Zealand! Packing for a year of settled life on an island where things are reputed to be quite pricy is a different story than last year, where we left with carryon backpacks and a minimalist attitude. This time, we asked ourselves how much we could cram into 300 pounds of luggage. Sports equipment and clothing are expensive here, so into the bags went our ski clothes, goggles, bike helmets and sleeping bags. Eric tossed in some basic tools, I brought my flatiron. The kids took along a box of legos and some card games, as well as favorite books and some art supplies. The tent didn’t make it, nor did our bikes, blender, printer, two burner griddle, waffle maker, kitchen scale, rock collection, entire library (for the boy) or guitars, though all of these were considered at some point and some people (cough the kids cough) tried to stuff them into the sacks when no one was looking. I didn’t check closely enough and the miniature amp made it, despite us not having a guitar to plug into it! We initially flew to California to visit my parents, and got a few looks as we lumbered along the Southwest baggage check-in line, where despite their generous baggage allowance most people seem to travel with little more than a roller bag. “Going camping?” the check-in guy asked, fishing for an answer. “We’re moving to New Zealand,” we replied. “Oh, I didn’t know Southwest was running an international moving service now,” he said with a smile. In California we had a lovely time with family and running around the Park where I used to play as a kid. The flight from SFO to Auckland takes 12 hours and 50 minutes, and normally I’d be too excited to sleep much at the prospect of being able to squeeze in 4, possibly 5 movies during that time. Alas, it was not to be as we were planning to drive directly to Whakatane on the day of arrival, and I’m more likely to sleep on a plane than Eric is. I ate the relatively tasty Hindu Vegetarian meal I always order (too much cumin this time) and slept somewhat fitfully for most of the ride. Even the currency exchange shows shade at Trump – make your USD great by making them NZ dollars! Off we went on the 4 hour drive to Whakatane, stopping off for tasty fish and chips just outside Tauranga and rolling into our our beachfront apartment around 2 pm. By coincidence, my longtime friend Judy and her son had been traveling in New Zealand and drove over to Whakatane to see us for a few days before they flew home. We got in some fun beach walks, hot spring time and tasty food. The first few days here could be characterized by a jet lag fog. Barely able to stay awake after 7 pm and then awakening at 3 am, I was dysfunctional for a few days, not even noticing the beautiful beach sunrises through our windows. We managed to get the kids enrolled in school and had them start on Friday, with good reports from both! The boy is in middle school here, which is 6th and 7th grades. Different from school at home, however, the classes are mixed 6th and 7th grades and most learning takes place in one classroom with the exception of specials. It’s a lot more low key than middle school in the States, which is like a pre-High school with lockers and different classrooms and the like. The boy is especially excited about the wood and sewing shop! The girl’s school is a more typical Elementary school, with the change that her class is combined with the one next door much of the time. One little quirk of Kiwi people everywhere is that they are often seen barefoot, and even on this rainy morning I spied a little boy scampering into school shoeless, splashing through puddles. After the jet lag improved, a feeling of panic set in. Where were we going to live for the year? An online search of listings yielded exactly NO properties. Perhaps people don’t list online? Eric and I then went to several realty offices to ask for long term furnished rentals, and as soon as we uttered the word “rental,” the realtors’ lower lips would stretch away and downwards with a sucking in of air, making the universal expression for “you are screwed, my friends.” Housing is always tight in New Zealand, and compounding matters is that a large flood earlier this year displaced many families who are now renting the houses that we might want to rent ourselves. The other problem is that many places are only rented long term during winter, and from December through April are rented short term for the holiday season (seasons are flipped here, so that’s summertime). Eric thought it was heee-larious to keep making jokes about perhaps renting a shipping container, or just living in tents, or getting two camper units. I failed to find this amusing. We went to visit one possible rental, only available through the end of November, which was split into two separate floors, both dingy and dark, with about two feet of aluminum countertop for a kitchen. Things seemed dim, and I bought a pack of Tums out of necessity. It’s a different culture here in that you have a better shot at things if you actually go in person to meet people, rather than the internet focused world of the US. We began to stalk our real estate agent with this in mind. Eric went in one day to find out that the rental agent was on vacation but would be back on Monday. On Monday morning, we wondered if it would help or our hurt our chances if we simply waited in front of the doors, staring through the glass until opening time like curious kittens. We decided instead to visit in the early afternoon, only find that she had gone out. We tried our luck a few hours later, and still, she wasn’t in. We were beginning to doubt her existence at this point. Tuesday morning we popped on over again, and voila, there she was. We considered shackling her to a chair lest she scurry off again, but she sat us down and told us of two places that were coming up on the market just that morning. Perhaps she was being friendly and helpful, but I think that she’d heard of our frequent visits and decided that getting us a house was the most efficient way to get rid of us, else we would take to haunting her office like wayward ghosts. We drove by one of the houses, another dismally dark rental with a tiny aluminum countered kitchen. Our spirits drooped yet again. I popped a few more Tums and wondered if it was acceptable to start drinking at noon in New Zealand, considering the circumstances. Central heating doesn’t exist here, so we hang out with sweaters, warm hats, and space heaters. That afternoon, she took us out to the other house and were happily surprised! It’s a 3 bedroom house with a wraparound porch, no yard to speak of, but that’s okay because the yard is the beach which is one street over. Most importantly, the kitchen is nice with good counter space, made from some variety of laminate and a good step up from prison decor. We called a few people we know here to ask their opinion, and everyone told us that we should lunge at the opportunity and take the place, and so we did. We’ve also managed to find a good car to buy here, so all in all things are looking better for now, given that we’re up to step one on Maslow’s hierarchy of needs. Next week, I start work, we move in, and I’ll post some pictures of the new house, our car, and the hospital! In which we lament the sad fate of 80s musicians, and PUFFINS! I awoke on my 40th birthday to a chorus of well-wishes. 40 is a big year, and Eric had asked me earlier in the trip about how I felt about turning 40. I thought about it, and I have to say that I feel really, really good about it. So much has changed in a generation – when my mom turned 40, we threw her an “over the hill” surprise birthday party. If anyone even thought of throwing me such a party, I would hurt them. Eric thinks that some of the difficulty with the milestone is that for many, it seems that few surprises remain after the age of 40, in that your life is relatively established and you can map out the future course with relatively depressing certainty. Not downhill, then, but perhaps more of a plateau. I can’t say that this resonates either – five years ago I never would have pictured myself where we are now nor predicted living in New Zealand for most of my 40th year. I think it’s easy to settle into a routine, and seems daunting to think about breaking it, especially as you reach mid career point which many people are at this age. We’ve been able to step out of that, and take the first big leap and you know what? It makes other big leaps seem so much more possible. So who knows what is on the horizon now? If anything, I feel excited by the time to come ahead. I love puffins. Something about their ungainly potbellied birdy bodies and their curved orange beaks is just too adorable not to. For my birthday, I thought we’d do a puffin tour! I’d read that for most of the tours, you can’t get much of a photo unless you’ve got a telephoto lens as puffins are surprisingly small. Instead then, I chose a tour where we would have some time with puffins but also venture out to the bay to do some fishing and then eat the fresh catch! 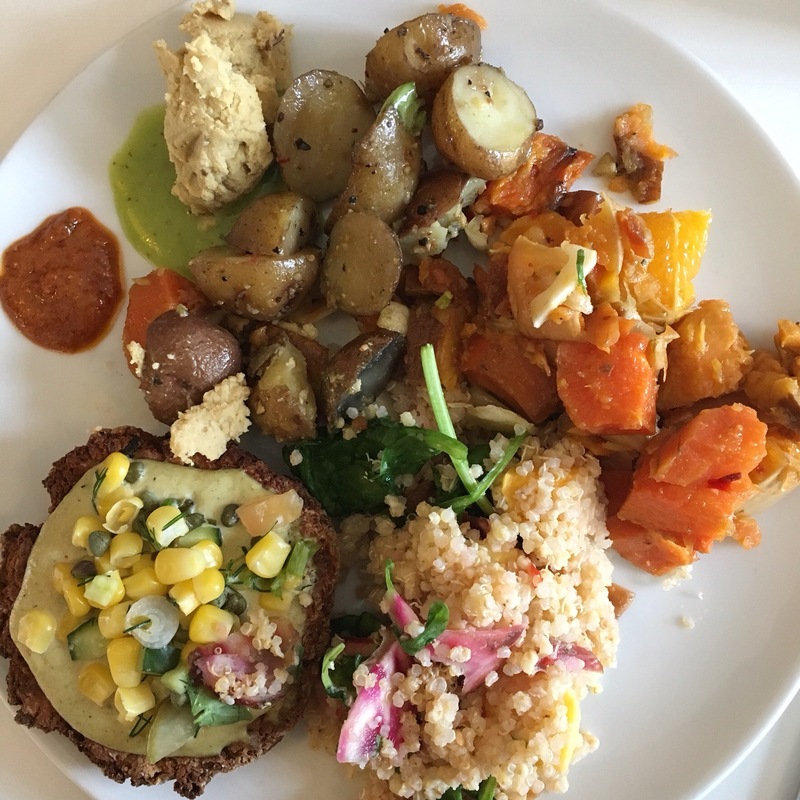 This may seem like an odd choice for a mostly vegetarian family, but I thought it would be nice to do something very, very different. And because I do eat fish occasionally, it seems hypocritical of me to not be able to kill one myself. I went with Happy Tours, a small family run company, because it was one of the few tours that provides good binoculars for the trip. Captain Snorri welcomed us on board the Saga and outfitted us with protective waterproof clothing, which was adorably oversized on the kids, making them look as though they were wearing rubber sumo suits. First, off to the puffins! They nest on a small island in the bay, and we saw quite a few with the binoculars. Most surprising is how fast the little critters are when they’re in flight, zooming across the sky despite what would seem like a lack of aerodynamic form. Then a little further out to drop long fishing lines and catch some cod for our lunch. The fishing poles were taller than us and a bit unwieldly at first, but we all got the hang of it. I can’t really say that fishing like this takes much skill – you drop the line down, the cod chomp on and you pull them up and into the bucket. The girl had a bite first out of our family, squealing excitedly and then needing a little help in holding the rod while she rotated the reel to pull up a nice sized catch! Captain Snorri efficiently dispatched the fish with a quick cut to the main artery, and we soon had a bucketful. Photo taken with my phone held up to the binoculars. Best I could get, really. Puffins! On the way back to the dock, Snorri sliced open the fish, showing us what they’d last eaten. A few small crabs for some, and for one a gourmet bellyful of caviar. At least he’d had a nice, rich last meal that one. He efficiently filleted the fish, tossing the offal overboard for the waiting gulls, who sometimes snatched the piece out of the air before it hit the water, and other times engaging in a battle for what goes as gull gourmet – the liver. Once at the pier, Snorri pulled out a hot plate and began to pan fry the fish with lemon pepper, tossing on new potatoes for a side dish. Friends, this was the most delicious fish I’ve ever had. The boy couldn’t get enough and ate four large platefuls. The girl, who normally doesn’t like fish at all had a fair share as well. 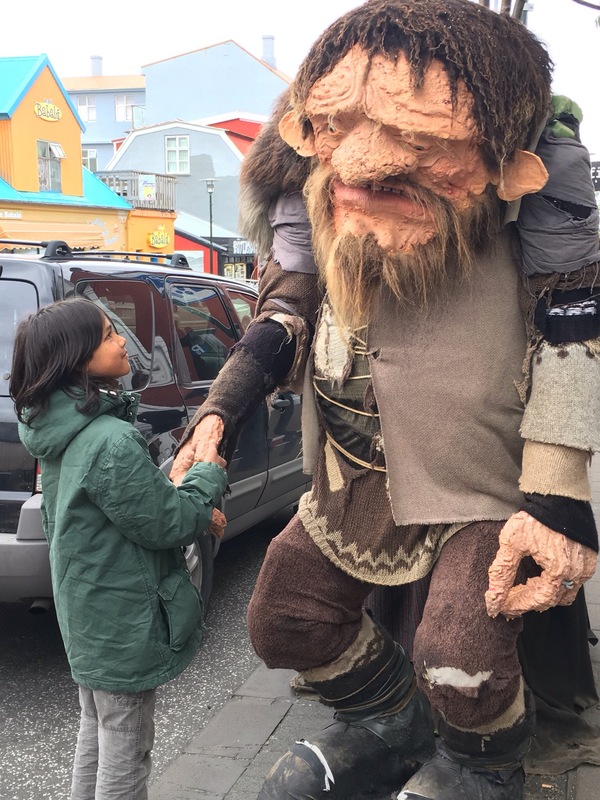 Bellies full, we thanked Snorri and his son and headed out to town for some souvenir shopping. My main interest in Icelandic souvenirs is the yarn. Iceland has a very proud knitting tradition, and even sells yarn in the grocery stores. Not the acrylic crap that you’ll find at a Wal-Mart in the States, but actual Icelandic wool from the sheep that dot the countryside, direct decendents of the original 9th century immigrant sheep, with long fibers that are spun into a delicate untwisted wool. At the icelandic equivalent of supertarget. Seriously. At the Handknitting Association of Iceland, I walked passed the sweaters and hats and scarves straight to the walls of Lopi, or Icelandic wool. It was so difficult to choose colors, but I managed! Yarn, it should be noted, is one of the few things in Iceland that is actually cheaper there than elsewhere and I picked up a sweater’s worth for $50. A handknitted Icelandic sweater will cost you around $200-300, which is a fair price for the time involved. In a world where mass-produced fast fashion for the lowest dollar has become the norm, it’s refreshing to see a place where artisan work is still valued. It was now almost 4 p.m., but as we didn’t have looming darkness to contend with, it was like we had a whole second day ahead of us. Eric found a hot spring river, where you hike about an hour in and then can have a relaxing soak. Normally, it would seem insane to start this at 4 pm – 40 minute drive, then hour long hike, then hour at the river, then hike out and drive back, we were looking at not getting back until 9pm. But as the light at 9 pm was no less bright than that of midday, off we went, fields of purple lupine flanking the highway. Changing radio stations in the car, Eric happened upon one called “80s flashback,” and we headed out, appropriately enough, to “Heaven is a Place on Earth.” They played mostly really good 80s music, and I could sing along to most of it. “I Wanna Dance With Somebody” came on, and we talked of the music video with the bright colors and dressing room scenes, and then lamented the sad fate of poor Whitney. “Heaven Knows I’m Miserable Now” started playing as we rounded a sharp corner, and Eric reminisced about the time he saw the Smiths on the “Meat is Murder” tour, and I reflected that Morrissey had kind of turned into a racist jerk. Soon enough, “Beat It” was on the playlist, yet another 80s artist with a sad ending. Later in the trip, “You and Me in Paradise” started up, and I immediately groaned and turned down the radio, because there is no reason to ever be forced to listen to the doldrum nasal plodding of Phil Collins. “God I hate Phil Collins,” I said out loud. “Why?” Piped up the girl from the back. “Was he a really bad sort of person?” “No,” I replied, “I just don’t like his music…as far as I know he’s a decent person who’s still alive.” At first I couldn’t figure out where her question came from, but then remembered our earlier conversation where Eric and I talked about the downfall of the prior artists, and realized that she must have surmised that poor lambasted Phil Collins must have also suffered some horrific drug-addled fate. The hike itself winds through gorgeous volcanic hills and valleys, covered in moss on the south side, the north side a black rocky cliff. Dramatic landscapes await around corners, where steam rises in long puffs from the ground in otherworldly welcome. Stretches of the trail had zero visibility with steam clouding the way, and as we rounded one such corner and emerged into view again, the river curved around before us, vapor rising into the cool air. Little natural and manmade dams of rocks and stones are laid across it at intervals, creating a series of small pools. The further upstream you go the hotter the water, so wandering along and dipping a toe in we found our Goldilocks pool, changed underneath towels and hopped in. The kids and I passed the time by balancing rock cairns on the stone dam in front of us. While there were a fair number of people there, there’s also quite a bit of river so we had our own little pool to ourselves and stayed in for an hour before the hike and drive back again. The river from above, you can see people soaking a bit downstream. Our last day in Iceland, and we thought we’d drive around the Golden Circle, what should be called the choking tourist yoke of Reykjavik. The drive itself is fine, but once you arrive at the sites you’re contending with tourists that have been spat out by the busload, small and large. I swear, one of these days I’m going to grab someone by the selfie stick and start beating them over the head with it. I can’t stand those things. The only saving grace of those idiotic fidget spinners is that all of the sidewalk stands that used to sell only selfie sticks now sell fidget spinners, which are far less intrusive to other people. In hindsight, I wish we’d skipped the Golden Circle and just driven somewhere a little off the path to a hike or perhaps to an accessible glacier, but that’ll have to wait for another trip. First stop was the Thingvallir, where the North American tectonic plate meets up with the European. You actually walk along the plate itself, and at places along the short walk it has split and fissured, as it’s still constantly moving, albeit slowly. It borders a little marshland with goslings and their protective parents, as well as shorebirds. Another 50 minute drive took us to Geysir, the original geyser. Is there a geyser there? Yes. Is it kind of cool? Meh. Are there a ton of people standing around waiting to get the exact same picture? Yes. The kids really wanted to see the geyser here, and I had a smattering interest but honestly, I think it’s kind of skippable given the other cool things Iceland has to offer. In false advertising, the large and impressive Geysir rarely erupts, and mostly you’re watching it’s smaller and poorer cousin Strokkur erupt every five to ten minutes. As we drove back to town, we happened across the Kerio crater and dropped by to take a look. Formed from the carcass of a burned out erupted volcano, a pool of aqua water rests at the bottom ringed by red lava stone. The water at the bottom doesn’t fill or drain, instead is reflection of the current water table. Back in the car, we picked up 80s Flashback again about 40 minutes outside of town. One of my 80s favorites “Right Here Waiting” came on, and of course, I knew all the words. As I sang along, Eric commented that he was basically the 80s precursor to Adele, singing as he did about pining after a lost love. Soon after “Every Breath You Take” was on, and I thought that that song could be the 80s precursor to Taylor Swift, the vindictive response of a jilted lover. The following morning we piled our luggag into the car, and turned on 80s flashback for one final trip to Keflavik Airport. “And you may find yourself in another part of the world…and you may ask yourself, ‘well? How did I get here?” the Talking Heads crooned as we drove, in a fitting last soundtrack before our flight back home. The Icelandic Air flights to Reykjavik welcome you to the land of ice and volcanoes with overhead lights of the aurora borealis. 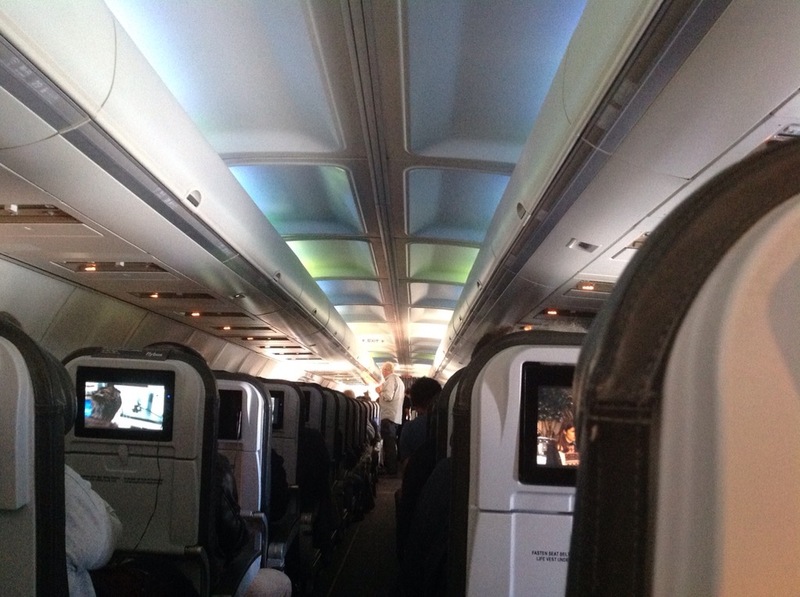 The seatbacks each have their own tv, and I watched a documentary called “Yarn” which follows four knitting and crochet artists from different countries who create art in very different formats. I found it interesting how they described knitting and crochet as looked down upon as craft and not art, because it’s largely the realm of women and is used to create practical goods. Men tended to be the weavers in society, producing tapestries that were used for decorative purposes. Women, however, would knit elaborate sweaters, socks, and other garments for use by the family. Something in the practicality of the items means that they are not seen as art, though it could be argued that really this should give them more value. One of the women who “paints” with crochet talked about how she is often criticized for not being a “real” artist because of this. I hadn’t thought about fiber arts in this light before, from a feminist perspective, and if you have the chance to see this documentary don’t pass it up. The airport is slightly confusing to walk through, and we ended up being the last ones to collect our luggage. I’d read many, many tips online that the cheapest place to buy alcohol was at the duty-free shops, so I got two bottles of wine there, anticipating we wouldn’t go out much because it’s so expensive. Icelandic residents could easily be identified at this point, as they were the ones who were hauling several heavy shopping carts each, filled to the brim with their allotted allowance of beer, wine and spirits, clinking like glass musical chimes as they rolled over the asphalt to their cars. We dropped off our luggage at our guesthouse and headed immediately to the pool and hot spring complex Lagurdasalag. We stopped at a sandwich place for lunch, and I was hit with severe sticker shock. I knew that Iceland was pricey, but when you’re paying $15 for a 9″ vegetarian sandwich it takes your breath away a bit. I immediately looked up some grocery stores for later eating. The pool was unbelievable, and exactly what we needed after the stairs of the Eiffel Tower the previous day. Man, the Icelanders really know how to set up a pool. A primer then, on Icelandic pool etiquette. At Lagurdasalag, you pay at a front counter and then get a rubber bracelet that then operates the lockers inside. Outside the main locker rooms are cubbies and lockers for your shoes, as your filthy shoes shouldn’t enter the clean space. Take your shoes off and put them here. If you’ve worn your $600 Jimmy Choos to the pool, you can put them into a plastic bag and carry them inside as well. (Of course, if you own these shoes you’re at the Blue Lagoon which costs $60/head and you can drink champagne and not here where it’s $9 for adults and $3 for kids.) Once inside, pick a locker and undress completely, leaving your clothes behind in the locker. Take your towel and your swimsuit with you to the showers, as you will not be returning to your locker until you’re done. Leave your towel on a metal rack outside the shower where it’ll stay until you’re done swimming. Take a shower and use the soap provided (or your own) to wash thoroughly. If you get confused about how to bathe, there are multi-language signs which have large yellow circles over the areas to scrub most vigorously. Now put your swimsuit on and head outside! The key is that the locker rooms stay dry – you would never take a shower and then walk back to your locker dripping wet to get your suit. Outside are several pools, a 50 m lap pool to the left, in front of us a large play pool with a waterslide and then smaller hot pools of various temperatures. Even though the ambient temperature was 56 degrees, the water was so warm that it was unbelievably comfortable and everything was so clean. 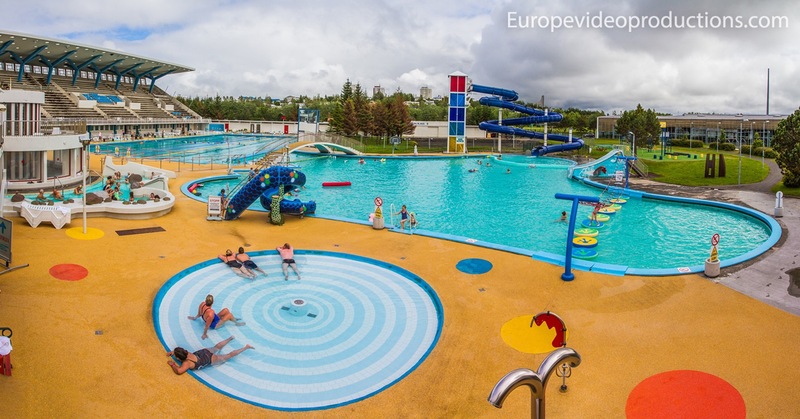 It’s like the opposite of American waterparks – it’s cold outside so you get into a hot pool. The main pool also has a variety of large foam toys to ride on, and foam islands to walk on. Eric swam laps first, then we all played in the warm water. When you’re ready to leave you repeat the process above in reverse – take a shower, towel off so you’re dry, then go to your locker, get dressed, go outside, put your shoes on and off you go. The Guesthouse Galtafell is just in downtown Reykjavik, and was perfect for us. While it was a bit of a splurge (I typically don’t spend more than $100/night for a place), I wanted a nicer place to stay for our last trip, and this was lovely with a sitting area and small kitchenette. We’d awoken at 5 a.m. to get our flight and were too exhausted to think of cooking, so we went downtown to Glo, a vegetarian restaurant I’d heard about. The food was super tasty, and is relatively reasonable for Reykjavik, but at $20/plate it was the last meal we ate out. Quite tasty! One main, 3 sides, and sauces. After this we went for a walk around town, and here is where I must admit to one of my worse moments on the trip. Friends, I had my very own weeping hour. 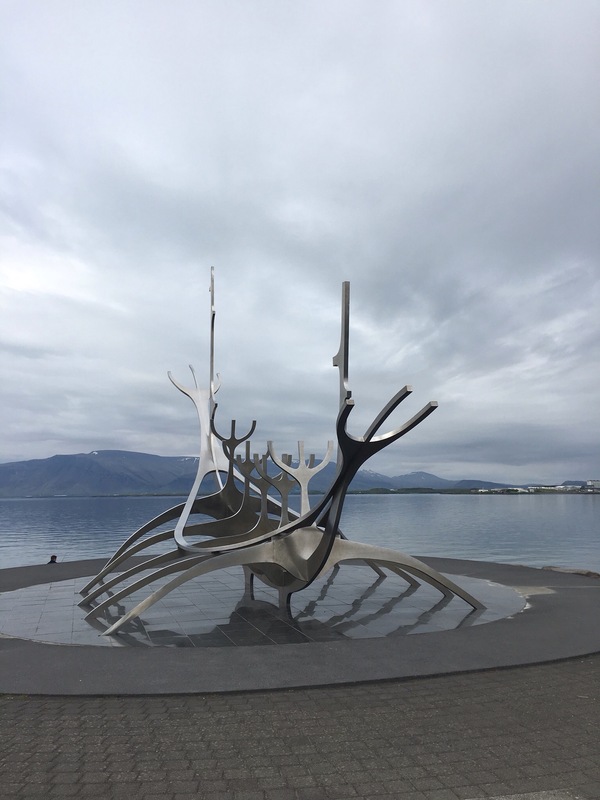 Reykjavik is a spotless little city, indeed the smallest (and northernmost, the boy tells me as he reads over my shoulder) capital city in the world. 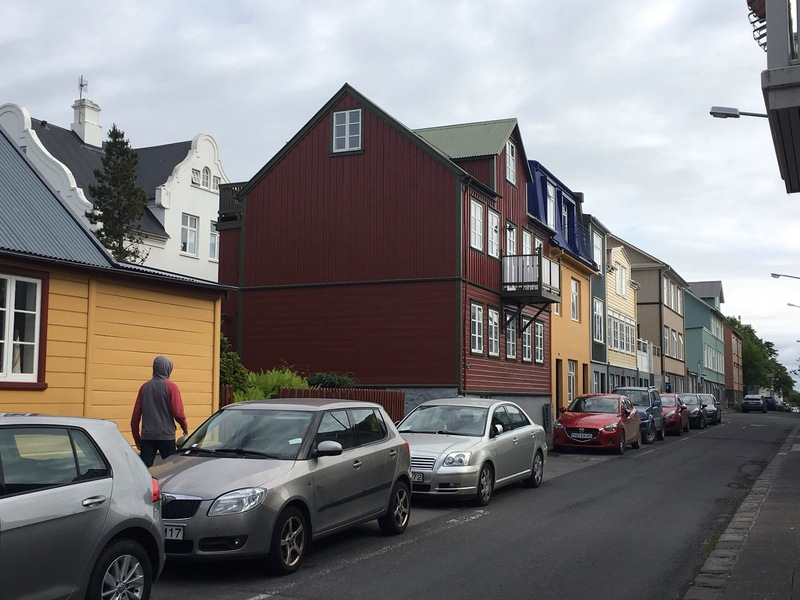 Houses are made of brightly painted corrugated aluminum, and the downtown area shops do a brisk business in selling anything alcidine, which I’ve just learned is the adjective word for puffins. My hope had been to walk around, check out the yarn shops, get some ice cream and then head home. The kids started fighting immediately as we walked out to the street, because they’re human and it had been a very long day, beginning with a 5:30 AM taxi ride to CDG airport. This got Eric to be appropriately upset because we hate it when our kids are acting meanly towards each other in public and especially in foreign countries, where I feel like we just represent America poorly and loudly. Ice cream was taken away as an option, it turned out the yarn shops were closed, and then Eric ran to a shop across the street to look at hats, and I felt abandoned. The kids and I ducked into a bookshop and then began the constant chorus of “Mom Mom Mom Mom Mommy Mom! Hey Mom! Come look at this! Mom! Mom?! Mom!” And I reached my limit. What really threw me over the edge was when Eric came into the shop and while the girl was actually pulling one arm of mine to go and look at something, he took the other to show me something else. Literally being pulled in two directions, like a frayed cord, I began to snap. “When do I get to look at something?” I wailed internally. We walked outside and Eric saw another hat he wanted to look at and took off again. The kids asked if they could go home and play a video game and the parents could go out, which made me feel like no one wanted to be with me at all, preferring a screen or hat shop instead. We were standing on the corner when I started to weep. 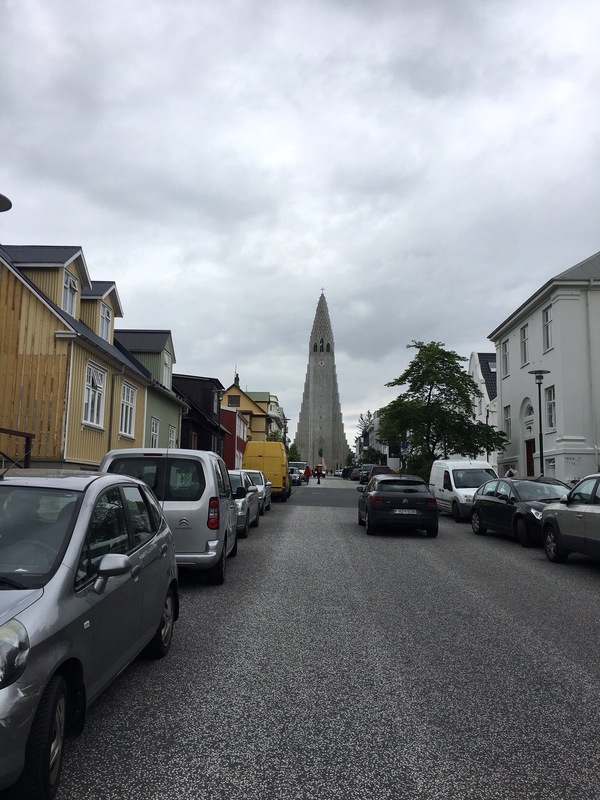 Street view looking up to the Hallgrimskirkja cathedral. No amount of cajoling could convince the kids to visit one more church. Sitting here now in full possession of my faculties, I realize this is all ridiculous. An objective look would just be a family wandering down a small main street and checking out various shops. The kids were beyond exhausted and didn’t have the capacity for wandering and just needed to go home and veg out for a bit. I get plenty of time to do as I wish for myself. In my over fatigued state, however, I couldn’t see this and just felt like the world was all against me. It wasn’t my finest moment, and I can’t say that I went to bed feeling any improved, such was the fortitude of my melancholy. The sun never fully sets here this close to the summer solstice, only dipping below the horizon so blackout shades are a necessity, and even so some light bleeds in through the sides. Despite this we all collapsed into bed and after a good night’s sleep, all was right again with the world.